Whether it is an open house, family event, grand opening or any other event you want to make an impression – the best way is to print vinyl banners. Print Factory offers high quality vinyl banner printing and design services. Our banners are printed on a durable, outdoor grated 14oz scrim vinyl. 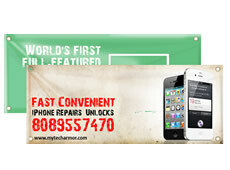 You can use printed banners for indoor or outdoor purposes. They are water and fade resistant, which means longer life of vibrant colour for outside use. Add hemming and grommets for more durability. Go as big as 16 ft x 100 ft. This product is also ideal if you have in store sales, property sale or as a business signage. Want the best results? Let us to design vinyl banner for you. Our creative and experienced design team will go an extra mile to make sure that your banner look amazing and attractive. Trust the professionals. If you have questions about vinyl banners, turnaround times, pricing and finishing options, please don’t hesitate contacting us. We are always happy to assist you over the phone, via email or in person.